Where to Ski in Japan, and When? Yup, it's finally snowing in Japan, and this can mean one thing for winter sports enthusiast: the Japan ski season is upon us. With deep powder, reasonable price and unique atmosphere, Japan is perfect for a ski holiday. The question is, where to go for the best skiing? To help you narrow down your search scope and find the ideal resort, here are some basics about the distribution of ski resorts in Japan and the best ones in each region. While there are over 500 ski resorts to choose from in Japan, when we talk about skiing in Japan, we often only refer to three specific regions: Hokkaido, Nagano and Tohoku (in Hongshu Island). There are two small resorts in Mt. Fuji, however, they mainly rely on artificial snows. Below is a map to help you understand the locations of some of the most popular ski resorts in Japan. Hokkaido, Japan’s northernmost island, has about the most consistent, lightest power in the world. With bouts of the snowstorm from Siberia, it receives more than 40 meters of snow in a single season. The most popular ski resort in this region is the Niseko, which attracts hordes of winter sports enthusiasts every winter. About 40 minutes' bus ride from Niseko, in the center of Hokkaido, is Furano, another awesome location in Hokkaido. Most of the ski resorts in Hokkaido have slopes for skiers of different levels. There are regular flights from Tokyo to the main city of Hokkaido - Sapporo. Located in Hokkaido, Niseko boasts one of snowiest resorts around the globe. It is probably the hottest ski and snowboard destination in Japan (the Australians particularly love it!) and also the most foreigner-friendly resort. Niseko has four inter-connected ski resorts (Annupuri, Higashiyama, Hirafu, and Hanazono) – all can be skied with one ski pass. Niseko Hirafu is the largest resort of the four and has arguably the best terrain and accommodation (and the most skiers too!). If you prefer a less crowded place among Niseko, the famous giant ski resort, Annupuri would be a great choice. Niseko is perhaps the best overall ski resort in Japan. It offers wide open courses, tree runs, backcountry, off-piste, and night-skiing. Plus, you can have views of the huge 1,898 meter-high volcano Mount Yotei, which is known as the "Mt. Fuji of Hokkaido". How to get there: Hop a flight to Hokkaido’s main city Sapporo. From there grab the bus for two and a half hours to the resort. Hit the Slopes of Niseko This Winter! Furano has less powder and less off-piste chances than Niseko but the good thing about this area is that you can still ski in great powder and feel very much part of a Japanese community. The area is divided into two sections, the Kitanomine zone (open mid-December until late March) and the Furano zone, (open late November until early May). Both sections have a variety of accommodations. The town of Furano is very quaint and authentic. As it is not as internationally famed as Niseko, it has emptier slopes. Here you can enjoy snow rafting, snowmobiling, snowshoeing, sledding and even hot air balloon ride. How to get there: Fly to Hokkaido’s main city Sapporo. From there grab the bus or train for two hours to the resort. Skiing in Japan, you couldn't go wrong! The Nagano region in Honshu Island is the other popular region for skiing in Japan. This region has the 11 ski resorts around Hakuba - and the fantastic Shiga Kogen, Myoko Kogen and Nozawa Onsen. It is steeper and richer in culture compared to Hokkaido, and has plentiful snow as well. Nagano can be easily reached by a bullet train from Tokyo. The Hakuba Valley is a well-balanced spot for skiing – it has both high-quality powder and easy access to Tokyo. With a total of 11 ski resorts and over 200 runs, it is the main venue for 1998 Winter Olympic Games. It receives an average of 10 meters of snow a season, so the reliability and quality of snow is good. It also has some of Japan's longest vertical skiing and challenging terrain. 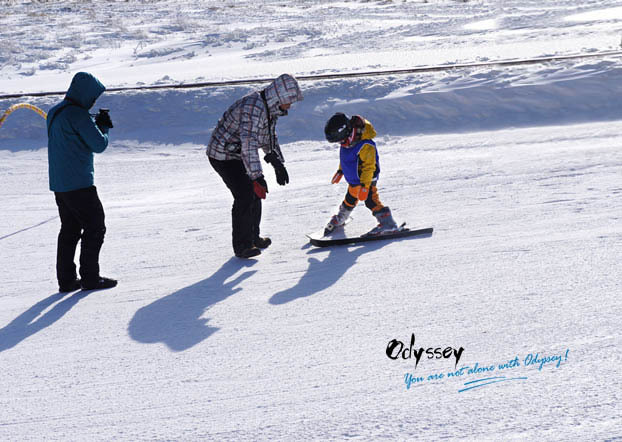 The main Hakuba ski resort, Happo One, is great for families with kids. There is also a wide range of accommodation including luxury options and self-contained lodging. When you get sick of the snow, you can do a day trip to Jingokudani National Park to see the monkeys playing in hot spring. How to get there: From Tokyo, you can take a fast train to Nagano (about 1 hour and 40 minutes) and take a bus to Hakuba (about 1 hour). Located in north eastern region of Hongshu Island, the Tohuku region, home to resorts like Appi Kogen and Zao Onsen, is also a great place for skiing, especially for those interested in good snow conditions and fewer crowds. Appi Kogen has 282 hectares of the ski area and 45 kilometers of runs. Seasoned skiers can hit the ungroomed steep slopes on Mount Nishi Mori while the kids can play on the gentle 5.5-kilometer Yamabato run. Seeking for off-piste options? Head to the on-site dairy farm that produces ice cream and cheeses or get a relaxing soak in the onsens. First-timers and tots can head to the mini ski area at The Spongebob Kids Park. How to get there: Take a bullet train from Tokyo (2-2.5 hours) to Morioka. From there take another train to Appi Kogen station (50 minutes) and then a 10-minute bus ride to the ski resort. Zao Onsen is both a hot spring and ski resort in the mountains of Yamagata Prefecture. The big drawcard of the resort is the ice trees known as "Snow Monsters" (Juhyo). The trees take on interesting shapes and can be found at the top of the mountain during the coldest months, usually from late December to the middle of March. The resort has 15 different slopes and 12 courses suitable for skiers and snowboarders of all abilities (especially beginners and intermediates). The longest course starts in the territory of the snow monsters at the summit of the mountain and is about ten kilometers long. How to get there: take a bullet train from Tokyo to Yamagata Station (about two and a half hours) and hop on a bus to Zao Onsen (about 40 minutes). When to Ski in Japan? For the majority of ski resorts in Japan, the ski season generally starts around mid to late December through late March or early April. For those in Hokkaido region (such as Niseko), the season can last until early May. Which ski resort looks best to you? Will you consider flying to Japan this winter? For a tailor-made trip to Japan, please contact me via . Finally, thanks for reading and sharing!